The Unicode Standard is the foundation for all modern software and communications around the world, including all modern operating systems, browsers, laptops, and smart phones—plus the Internet and Web (URLs, HTML, XML, CSS, JSON, etc.). The Unicode Standard, its associated standards, and data form the foundation for CLDR and ICU releases. Thus it is important to ensure a smooth transition to each new version of the standard. Unicode 10.0 includes a number of changes. Some of the Unicode Standard Annexes have modifications for Unicode 10.0, often in coordination with changes to character properties. In particular, there are changes to UAX #14, Unicode Line Breaking Algorithm, UAX #29, Unicode Text Segmentation, and UAX #31, Unicode Identifier and Pattern Syntax. In addition, UAX #50, Unicode Vertical Text Layout, has been newly incorporated as a part of the standard. 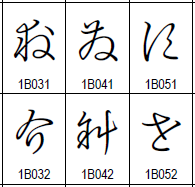 Four new scripts have been added in Unicode 10.0, including Nüshu. There are also 56 additional emoji characters, a major new extension of CJK ideographs, and 285 hentaigana, important historic variants for Hiragana syllables. Please review the documentation, adjust your code, test the data files, and report errors and other issues to the Unicode Consortium by May 1, 2017. Feedback instructions are on the beta page. See http://unicode.org/versions/beta-10.0.0.html for more information about testing the 10.0.0 beta. See http://unicode.org/versions/Unicode10.0.0/ for the current draft summary of Unicode 10.0.0. The membership of the consortium represents a broad spectrum of corporations and organizations, many in the computer and information processing industry. Members include: Adobe, Apple, EmojiXpress, Facebook, Google, Government of Bangladesh, Government of India, Huawei, IBM, Microsoft, Monotype Imaging, Netflix, Sultanate of Oman MARA, Oracle, Rajya Marathi Vikas Sanstha, SAP, Symantec, Tamil Virtual University, The University of California (Berkeley), plus well over a hundred Associate, Liaison, and Individual members. For a complete member list go to http://www.unicode.org/consortium/members.html.